The Hatch Corporation RFK300 Resister duty gloves are constructed with a premium leather shell and DuPont® Kevlar® knit liner, which offers a significant amount of cut protection from razors, knives, and other sharp objects. Designed by Hatch, these search and duty gloves provide the dexterity and protection law enforcement officers need for everyday duties in the field. Please note this glove is cut resistant, and not cut proof. CE test results are available regarding the RFK300 cut and puncture resistance. The fit is perfect and the quality couldn't be better. They are part of my daily duty gear. Gloves are awesome perfect fit. Went with the extra large because of warnings, good thing I did. Extra large was tight but I'm sure they will stretch a little. Field tested these, and they hold up to their specs: Slashing: Gloves resisted heavy slashing fairly well, although a seven inch plus or heavy blade could end up breaking your fingers. Stabbing: These gloves are easily punctured, DO NOT COUNT ON THEM TO PROTECT YOU FROM A DIRTY NEEDLE, nails would also easily penetrate. The single layer of kevlar will REDUCE, BUT NOT STOP, puncture trauma from stabbing. ChoppingHacking: I was able to hack off the fingers no problem with a machete, in action you might be able to successfully catch a machete swing with these if you had as much area of both palms across the blade, and softened the blow by going with it, but don't count on that going very well. Sizing: The suggestions to order 1 size larger ended up being way too big, use the chart provided unless you have extremely fat, long fingers. Comfort: They are comfortable and will keep your hands warm in 40-50 degree weather. I have finally found these particular gloves for my husband. My husband doesn't like his gloves to go over his wrist. I looked everywhere last year (except your website). Buy them one size larger. They work great, last pair lasted 10 years. I normally wear large size in gloves, and the and circumference measurement indicated that I should wear a large. The large was too small, so be cautious of sizing. The extra large fit fine. Excellent, though they do tend to be a little on the smallish side size-wise. Great fit, comfortable. Recommend to all that conduct any type of pat searches. Nice gloves, they run a little small. I love these gloves, I have decent size hands and these gloves fit with no extra material (L). Leather outside, Kevlar type inside. Covered by my employer as meet our requirements. Comfy and still have decent feeling at my fingertips for searches and trigger control. I love these gloves. No extra material at the fingertips. Great as search gloves and for shooting gloves in a general purpose. 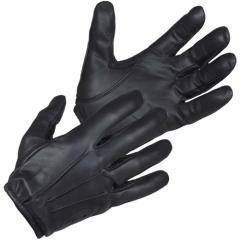 These gloves are sturdy and while very comfortable, provide the protection and security I need. I'm very pleased with the quality of this product. These are nice gloves and I would use them regularly if they fit properly. I initially got the larges and they ALMOST fit right but the corner between the thumb and first finger came up too high restricting movement of the thumb. I exchanged them for XL's and they were too large in all areas EXCEPT that corner between my thumb and first finger where it fit perfectly. Perhaps it is only my hands that they don't fit but I wish they did because otherwise, they are great gloves. I loved the service. The product has been everything the description said it would be. It got to me in the time it said the item would and it was easy to track my order. No complaints what so ever. These were a Birthday gift, he loved them.